For a few weeks we noticed there was a small tortoiseshell cat sneaking in the house, eating Aphex’s food when we were upstairs/sleeping. Jeff kept trying to shoo her off, but I just told him to leave her and let her come/go without scaring her as she was probably homeless. 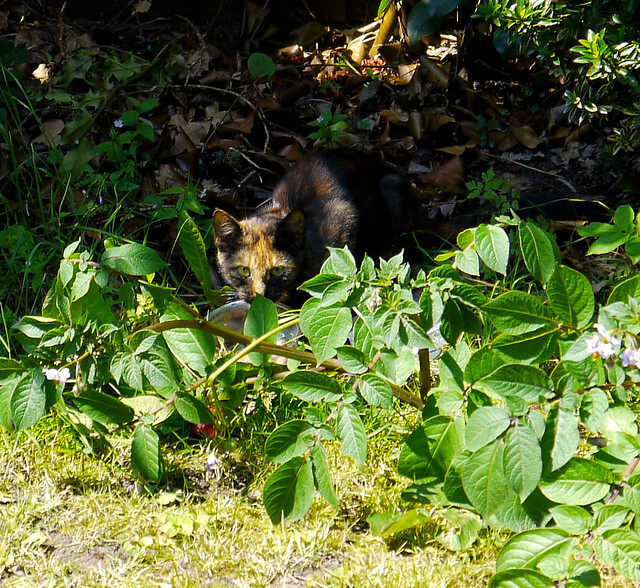 Then on a Sunday (3rd of July) we went out for a meal with some of Jeff’s friends and when we got back you went out, and I noticed the cat under the bushes in the garden. So I got some ham from the fridge and threw it near her. She ate it. I then put some cat food in a bowl and put near her and watched her eat it from a distance. She was cute, but a little odd looking I thought. After a few minutes I went back in and got those little cat treats, sat a couple of meters away from her on the grass, and started chucking them, one at a time, near her. By then Aphex was out in the garden, watching. I then started playing with a little branch and Aphex, and then waving it towards her, as she watched. I’m not sure what I thought I was doing, I certainly wasn’t planning on getting a new cat, just to make friends really. So I threw a few more cat treats, and started calling her. She kept looking at me right in the eye (more like a dog than a cat) and then suddenly, she just jumped out from under the bushes and started putting her scent all over my hands and purring non stop, a really loud, chirpy purr. Jeff came out and she was rubbing herself all over his hands too. And so we just sat there for a while enjoying this. Aphex was a bit miffed and went for her a couple of times, but she just wouldn’t leave, even though she never attacked Aphex back, just growled. And then we started making moves to go in, and she followed us, and she was so sweet and parked herself on our laps in the living room, purring, and really looking like she liked human company and needed a home, all the while making lots of eye contact and being the cutest cat ever. So, since that day she’s been here! 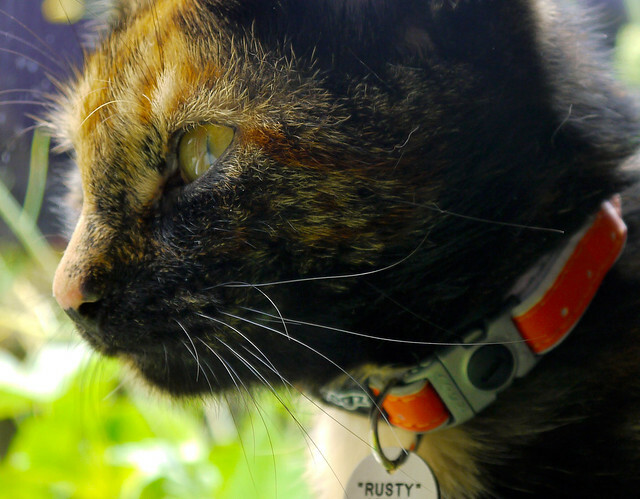 First I called her Tortie… But after 3 days or so, Rusty seemed to make more sense. Because of how she looks, and also her purr, sometimes it sounds like a broken toy. It sounds a lot less like that now, although she does still have a chirpiness to her purr that Aphex doesn’t have. Her second name is Gizmo, because at first I thought she was a little Gremlin like looking, and Gizmo was a potential Gremlin. The two names also sound good together. Rusty Gizmo! Rusty Gremlin didn’t sound so good. Of course after a couple of hours with this sweet, loving kitty, she just started to look like the most beautiful cat ever (along with Aphex, of course). But while Aphex is seriously aloof and independent, Rusty is the opposite. She’s more settled now and therefore less eager to please, but she does like a lap, and she’s always in the living room with us, while Aphex prefers her own company more. The twist on the tail of all this is that she may be pregnant, she’s not stopped eating and her tummy has grown a lot. The first thing we did was flea/worm treatment, she was farting a lot on the first week but now that has settled. Her eye’s third membrane was quite prominent, but that’s much better now too. But she sleeps and eats and that’s about it. When I took her to the vet she couldn’t feel anything baby wise, but it was probably early days, her tummy has really come along in the last two weeks. Which puts me in a terrible dilemma. 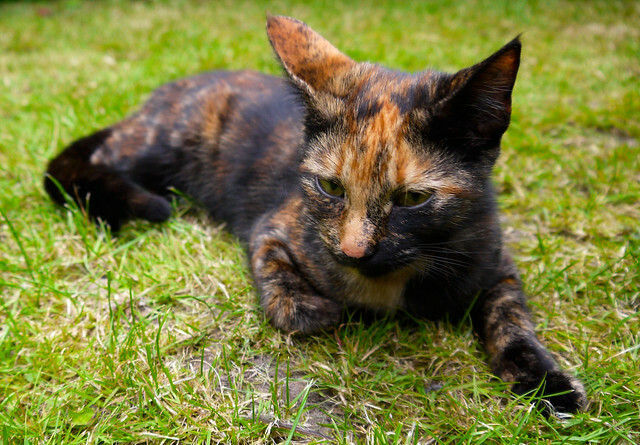 She was clearly abandoned (and according to our neighbour Dee, she’s probably only very young as she saw a kitten looking like her in her garden a few weeks ago, and the other neighbours said she used to steal their cat’s food too). We have another vet’s apt. next week and if she’s pregnant the vet said the babies should be killed, as there are so many abandoned cats at the moment, due to recession. And while I understand that, I’m wondering, would Rusty ever be the same if we did that to her? There’s nothing more lovely than having kittens in the house, I remember that from childhood, and I think you would so love that. But then again you’d be away while they were born I think. So that’s the next big decision that needs to be made. I know I’ll hate myself if she’s indeed pregnant and we kill he babies. It’s not that I’m anti abortion, but it’s one thing to decide for yourself, and another to deprive an animal of its most basic need/drive, the need to reproduce. At least with Aphex it wasn’t my decision, as she’s Jeff’s responsibility. But Rusty is mine to care for. Anyway, I got her chipped on the first visit to the vet, and got her a nice collar with a name/number plaque. She’s officially my responsibility. A great 40th birthday gift from life to me! Aphex and Rusty are still not the best of friends, and I’m not sure it’ll ever get past the toleration level. But Aphex just seems fascinated by her, and it’s just really funny to watch those two.